It’s not everyday that you read a book for which you are profoundly grateful. But this is one. 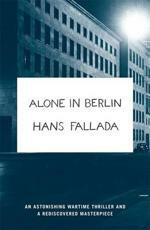 Hans Fallada (the pen-name of Rudolf Ditzen) wrote this book in a frenzy in just 24 days, and died just weeks before it’s publication. First published in Germany in 1947, it has only now been translated into English by Michael Hofmann (in the USA, for some reason it is called Every Man Dies Alone). It recounts the lives and fears of the occupants of 55 Jablonski St in 1940 Berlin. This one house stands as a microcosm for the various forces at work down at street level during the horrors of the Nazi regime. Life is hard, decision-making complex, consequences terrifying. The key thing is that this is the about what happens at the bottom of the pile as a result of decision made at the top. The regime has corrupted and infected every aspect of daily life. What is so extraordinary about this book is that it opens a window on to ordinary life in Berlin at time when the Nazis still seemed to be winning the war. The conquest of France looms large and Hitler was unstoppable. Was resistance possible at all? And could it ever be remotely effective? It’s one thing to agitate on the fringes of the Nazi empire – but what about at its kernel? In a climate of suspicion and hatred, the slightest misstep out of line would be observed by the countless informers simply out to cover their own backs. The result of this is a profound sense of isolation and distrust – hence the book’s title. In an imperial city of millions, everyone in Berlin is ultimately alone – not just when they die, but while eking out their existence beforehand. But this is where the wonder of this novel strikes home. There are shafts of light in the midst of the darkness. The activities of the protagonist couple, Otto & Anna Quangel, seem futile. And yet they have a profound effect on the most unexpected individual. (I won’t spoil who). There is the unexpected, silent but nevertheless consistent kindness of a retired judge. Then there is the Lutheran prison chaplain dying of TB who does what he can (it is surprising to find such a positive portrayal of a Christian in fiction – though it is counterbalanced by another chaplain who is clearly more venal and vile like the regime he works for). The universe of Nazi darkness is vast (the cast is full of the basest and cruellest in fiction) – but the few and far between stars that do shine out, do so with compelling and wonderful brightness. This is no easy read – but it is an unputdownable and vital read nevertheless. ← Preaching silhouettes – Lennox and Simeon!